I am a woman of many tastes but when it comes to perfumes I always rely on the classics. I receive tons of compliments every time I wear one of these perfumes, mainly because their smell is memorable and long-lasting. I use all of them on a daily basis and that’s why, unfortunately, they’re almost gone. Anyways, let me tell you more about them. J’аdore and Channel Allure on her beauty stand. I got acquainted with both perfumes, thanks to my mom and they always remind me of her. Classics all the way! Other more recent scents that I love are L’instant de Guerlain and Burberry Body. The one by Guerlain is a bit different and stronger (reminds me a bit of a man perfume) but is still great for evenings. As for Burberry Body – I’ve had it for 2 years and have been using it almost every day but its scent is as long-lasting as when I first tried it. Definitely recommend it! My most recent purchase and latest addition to my favourites is Love, Chloe. Great, super long-lasting perfume with memorable, feminine scent, which can hardly stay unnoticed. And I love the design of the bottle – simple and elegant with the chain! Which are your favourite scents? They sound great! In my last post I'm also recommending my favorite perfumes, go and take a look! I really need to buy one! 🙂 gonna try these at the store, thanks for the tips! I'm such a noob when it comes to perfumes so I'll gladly listen to any recommendations people have haha! I'm really into soft feminine scents so I think I'll check out Love, Chloe a bit more 🙂 The bottle is so elegant. 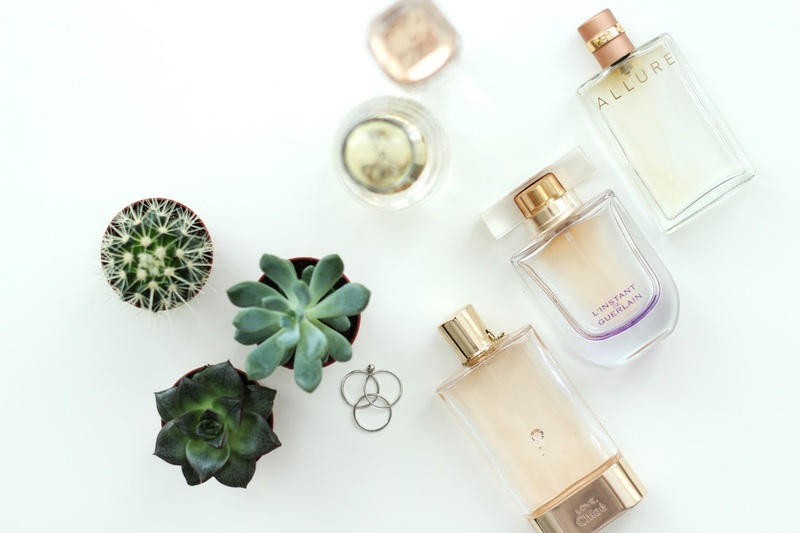 I really love how you took youe blog photos, love those perfumes as well! Love the Chanel perfume, it's so good and classic! Great pictures! Wow, honey, your photos are amazing! Love the brightness of them! I also prefer to wear classic perfumes! Great perfumes and photos!! Thanks for sharing. Аз също съм огромен ден на Burberry Body и го използвам от доста време 🙂 Останалите са ми познати само като аромат, но Love, Chloè и Allure опредлено са любимци! I definitely recommend Love, Chloe! One of the best perfumes I've used! And thanks for telling me about Mexx Icetouch, I'll try it out cuz I'm looking for a new fragrance for the summer!